How would you like to service your drinking fountain without disassembling the unit? With Murdock water coolers, you can! In this article, you will learn about what differentiates Murdock water coolers from other water cooler brands, how easy it is to service Murdock Maintenance Advantage Water Coolers, the different options now available, and why you should order your Murdock units from Equiparts. We also have an informative video of Bob Murdock during his most recent visit at Equiparts that shows you how easy it is to service Murdock units. Murdock water coolers are designed to make life easier for the maintenance people who service them. The simple configuration of their drinking fountains, water coolers, and bottle fillers allows for easy access to the parts that need attention most often. In addition, there are less moving parts to potentially repair, making maintenance calls less frequent. For example, instead of three push buttons on a water cooler, Murdock fountains have only one. Service tasks like turning off the water, cleaning the strainer, changing the filter, adjusting water stream height, and replacing the cartridge can be completed easily and without disassembling the unit. See how easy it is to complete these tasks on a popular Murdock Water Cooler model in the video below. Many Murdock units that were installed over a century ago are still fully functional today. They are a testament to the high-quality craftsmanship and durability of Murdock units. See just how easy it is to service a Murdock water cooler, and learn about some of the features and options available for the Murdock model A171408F-BF2S water cooler with bottle filler in the how to video above. Murdock has 15 different series of water stations available. Below is a sampling of the different series and the various models and additions available for that series. The Classic series is designed in likeness to the original Murdock fountains. This series includes tulip-filigree-style pedestal outdoor fountains with brass polished bowls and bubblers and manual foot pedal operation. These units are available in barrier-free, ADA-compliant, and freeze resistant configurations. Other features include child height, dual height, push buttons, and pet fountain attachments with three bowls, as well as other additions. The Outdoor Bottle Filler Series contains a collection of outdoor hydration stations with bottle fillers. The models in this series are stand alone bottle fillers, bottle fillers with pet fountains, drinking fountain bottle filler combination fountains, and many other variations. These outdoor bottle filler units are available in manual or sensor activation, with finish options including stainless steel or powder coated steel in a variety of colors. The Water Cooler Series has a variety of wall mounted water cooler units with models that include single manual water coolers and bi-level water coolers with sensor operated bottle fillers and bottle counter displays. This series also contains indoor recessed and semi-recessed sensor and push button bottle fillers as well. These units are available in stainless steel or galvanized steel powder coated finishes. There are different bubbler options and vandal resistant push buttons available for these units as well. Murdock offers lots of customization options. They can add your logo or mascot onto your fountain, cooler, or bottle filler as a vinyl sticker. They can also leave an area of your unit uncovered during powder coating which will leave the shape of your logo or mascot in stainless steel on your unit. Every Murdock unit is tested for leaks and other potential problems before it is approved for shipping. In many situations when a Murdock unit in the field needs repair, the company will send a service team to inspect the unit or units and perform any necessary repairs. Equiparts is a direct distributor of Murdock fountains, water coolers, bottle fillers, and repair parts. Bob Murdock, the owner of Murdock Manufacturing, visits Equiparts frequently to showcase products and teach our sales managers what makes Murdock fountains different from other drinking fountains on the market. He provides detailed information on the various models available in each series, the options available for each model, and how each unit functions internally, as well as how to service them. Equiparts carries a variety of fountains, water coolers, bottle fillers, filters, and repair parts in stock. We can supply you with any model, including custom orders. At Equiparts, we work with Murdock to fulfill your order accurately, and we’ll ship it to you as quickly as possible. Give us a call at 800-442-6622 Monday through Friday, 7:30AM-5:00PM EST to learn more about Murdock fountains and place your order. 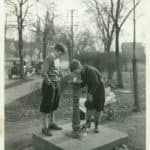 Murdock has been manufacturing fountains and hydrants for over 160 years, since 1853. In 2005, Murdock began a new partnership with Morris Group International (Acorn). Today, Murdock carries a variety of fountain lines, including classic and retro units like they made in the 1800s and 1900s, and new modern lines including bottle fillers, water coolers, pet fountains, contemporary round and square series, and more. View our selection of Murdock fountains and find out what’s on sale now!